ALL PUPPIES PURCHASED OR PICKED UP IN MISSOURI ARE SUBJECT TO MISSOURI SALES TAX OF 5.662% OF PURCHASE PRICE. The Miniature Dachshund is a lively little companion. They greet you with tail wagging and eyes sparkling with delight. Due to their small size and hardy nature they are a favorite with children. Miniature Dachshunds come in many colors and patterns and varied coat lengths. They prefer to be warm and will often be found laying where the sunshine is radiating through a window. The Maltese is a toy bred with a flowing white hair-coat and gorgeous black points. They have always been highly prized and the dog of choice to royalty around the world. They are very small in size with the preferred adult weight of 4 to 6 lbs. Their intelligence makes them quick learners that respond well to positive discipline. They are gentle mannered and playful, great as family companions. They require daily grooming to keep their gorgeous hair-coats tangle free. The Maltipoo is an awesome little companion. Because they are small they are a great choice for people with limited space or small apartments. Their gorgeous hypo-allergenic, none shedding hair-coat comes in many colors to suit almost any taste. They are intelligent like the Toy Poodle and loving like the Maltese. They prefer to stay in your company. They are excellent family companions and small enough to take on all of your outings. The MalShi is a delightful little family companion. Friendly and loving by nature. 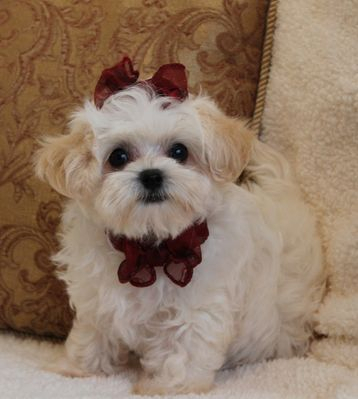 They are a hybrid with a Maltese sire and a ShihTzu dam. They have the hardy characteristics and adorable teddy bear face of the ShihTzu with the smaller size and exceptional love for people of the Maltese. They come in all the colors of the ShihTzu. They are great for apartment living and do not require much exercise. The Morkie is a spunky little bundle of joy. They have a Maltese daddy and a Yorkshire Terrier mom. They are a toy size and great for small apartments. They exhibit the loving traits of the Maltese with the resilience of the Terrier. They are great to take on walks and enjoy a playful environment. They are packed full of personality and who could resist a face like that? They love people and are a very loyal and loving companion. Show-Me Puppies is located in the beautiful Ozarks. Our puppies and dogs are very important to us. We are one hundred percent dedicated to our dogs and puppies. Our home raised puppies and their parents are handled daily and are well socialized. Our puppies are raised indoors with lots of tender love and care. Our goal is to raise the healthiest, happiest puppies possible and place each in a loving home. We enjoy learning a little bit about our puppy's new families. We strive to match each puppy to an environment that will be fulfilling for all involved. Please don't be offended if we ask a few questions. Your answers to these questions will help us understand your expectations for you and your new family member. We love to stay in contact and support you as your puppy grows. We are especially appreciative of those willing to share family photos with their companion as he/she grows. Your puppy will be examined by a licensed veterinarian before leaving our care. This is a third party professional evaluation of your puppy. You will receive a copy of this documentation before taking possession of your puppy. We give a one year guarantee against genetic defects. Our puppies are sold as pets only on a "first come, first serve" basis to approved homes. Pictures will be posted of each puppy at approximately 6 weeks of age. We will be taking deposits to hold the puppy of your choice at that time. Balance payment is required on or before puppy turns 8 weeks old. Balance payment must be paid and clear before puppy will be delivered. View our puppy pages by clicking the links at the top of this page for prices on available puppies. Your puppy can be transported to the major airport nearest you, depending on availability. This transportation is by a third party professional transporter. Puppies cannot be shipped until they are eight (8) weeks of age. Our puppies are delivered to the departure airport in a climate controlled environment. In most cases, our puppies experience same day delivery. Extra precautions are taken to ensure that each puppy arrives at his/her new home healthy and sound in every way. Please Note: Extreme weather conditions may delay delivery of your puppy. Please understand these weather conditions and the delay that they may cause are out of our control. Please be understanding of our limitations as we strive to do our best to get your puppy to you! Flexibility on your part is always a big help. Puppies are live animals and extreme temperatures in either direction can delay the transportation process. The airlines will not allow live animals to fly in extreme temperatures. Please be aware that these rules and regulations are made to protect your newest family member! We welcome local pickups. If you are planning to pick your puppy up please contact us at 417-293-4468 to make arrangements. We place our puppies in pet only homes. We do not place any puppy for breeding purpose and we give no guarantee of breedabilty of any puppy. We strongly encourage you to have your puppy spayed or neutered. We strive to make your puppy buying experience as pleasant and simple as possible. In order to serve you better, we accept payment through PayPal. You may use any major credit card via PayPal without having a Pay Pal account. If you have a PayPal account you can use it as well. For more details on how to use PayPal to purchase your puppy please call Vernetta at 417-293-4468 or e-mail us at: vfcockrum@yahoo.com We appreciate you taking the time to look around our site. Don't miss your chance to own a Show-Me Puppy! !